What's the Deal with MUJI? What’s the Deal with MUJI? Unique aesthetic and brand philosophy make MUJI a stand-out addition to Toronto's retail landscape. MUJI has landed in Toronto. The Japanese design-oriented shop opened its doors at Yonge and Dundas at the end of last year following commercial success in Europe and, more recently, New York City. MUJI’s concept is simple: no-brand, good-quality design that’s made to last. Such an ethos should fit right in here in Toronto, where artisanal everything is having a moment. MUJI was founded in 1980 in reaction to the disposable consumerism and foreign luxury brands that were, at that time, creeping into Asia. The company boldly sought to curb consumption patterns by focusing on quality while rejecting the idea that a label lends value. Thirty-five years later, MUJI has expanded from generic department store brand to global designer favourite. The company still holds up in the great design category, with beautifully simple basics as diverse as cashmere scarves, acrylic toothbrushes, and sleek humidifiers gracing store shelves. MUJI’s no-clutter philosophy is still going strong: a quick glance at the shop’s housewares department will make minimalist hearts flutter. If you’re looking for great quality, though, pay attention to which MUJI items you’re purchasing. The brand’s rejection of low-cost items has tapered off, probably in an effort to stay competitive in the global marketplace. Beside that cashmere scarf is a viscose, cotton, and nylon toque, and around the corner from that, a polyester blend suit. 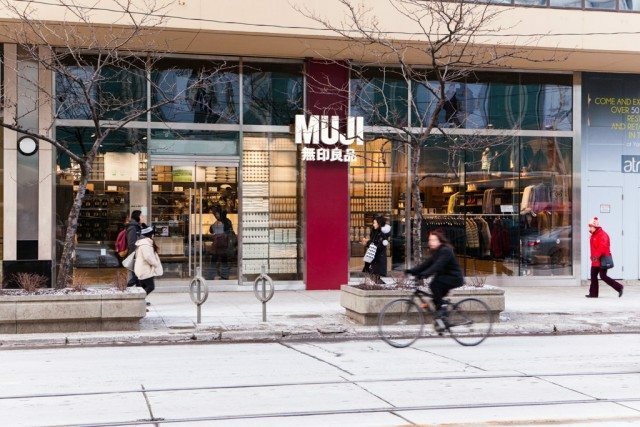 Though the brand’s quality can be hit-or-miss, MUJI’s diverse offerings and unique aesthetic make it a great addition to Toronto’s retail landscape. Where else can you grab a set of chopsticks, a duvet cover, and a new pair of khakis all in one place? Just don’t be fooled by things that read “cotton” or “canvas”—some of these are blends. To find out if what you’re purchasing is one of MUJI’s better offerings or a low-cost item, you’ll just have to check the label.